Bitter Orange opens with Frances Jellico incarcerated, dying of an unnamed wasting disease though whether she is in a hospital, an asylum or prison is not clear. Only Victor, her friend, the once vicar of Lyntons parish visits, hoping she will confess something before leaving the earth. Even at this early point in the story, nothing is as it seems, with Frances hinting that Victor is not really a vicar and only wears the dog collar so he can see her. Told in flashback, mostly in first person, Frances now sixty, remembers 1969, her summer of love. She remembers Peter and Cara. Cara who will tell Frances she is beautiful. I was thirty-nine when I sat on the jetty, and in my whole life no one had ever said I was beautiful. Later, when Cara was folding the tablecloth and putting away her cigarettes, I leaned over the green water of the lake and was disappointed to see that my reflection hadn’t changed, I was the same woman, although for a while that summer, twenty years ago, I came to believe her. Even though the disease is causing Frances’ memory to fade, which leads the reader to question her reliability, images return in waves, merging and converging. Not all of them pleasant and as she thinks about dying, she remembers her final look through a judas hole. I am kneeling on the bare boards of my attic bathroom at Lyntons…In the room below mine, a body lies in the pinking bathwater, the open eyes staring up at me for too long. The floor is puddled and the shine of wet footprints leading away is already disappearing. Frances was approaching 40 when her mother, after many years of sickness, died. She is offered the opportunity of surveying the garden architecture of Lyntons, a deserted English country house, for Mr Liebermann. A mile away, beyond the parkland, dotted with mature specimen trees, the house – Lyntons – balanced at the top of a green bank. It extended back into shadow, but the view I had was of wide stone steps leading up to a magnificent portico where the afternoon sun buttered eight immense columns which rose to a triangular pediment…behind the buildings the land rose steeply to wooded hangers – a geographical feature of that part of the country: ancient woodland clinging to the sides of steep scarps which twisted and turned for several miles. When Frances arrives she is greeted by Peter and his younger flamboyant, temperamental girlfriend, Cara. Peter too is to write a report detailing the contents of the house for its new American owner. At first Frances keeps her distance, concentrating on the job in hand, dreaming of discovering a Palladian Bridge and writing an article that would be published in The Times. She wanders through the gardens, surveying all she sees. I sat here while the sun rose higher and attempted to draw the bridge and lake in my sketchbook. I was used to being alone and mostly content with solitude even when in the middle of a London crowd, but here, sitting by myself beside Lyntons’ lake, I was conscious of the couple up at the house and found myself wondering what kind of people they were. Encouraged and welcomed, Frances, or Franny as she becomes is soon embroiled in Cara and Peter’s lives. Some people are storytellers and some, listeners; Frances the latter. But the stories that Cara tells don’t quite add up – and as Frances becomes increasingly entangled in the claustrophobic lives of the glamorous, hedonistic couple, the boundaries between truth and lies, right and wrong, begin to blur with devastating consequences. But for who? Nothing is as it seems in this novel. Although Cara and Frances seem opposites, one loud and gregarious, the other quiet and withdrawn, they have similarities. Both from oppressed, sheltered childhoods with mothers that chastised, both from fatherless families. Both wanting love. 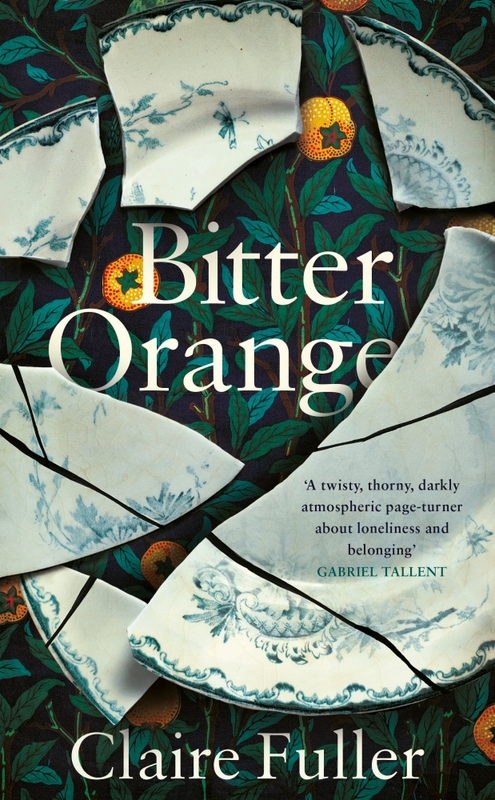 Bitter Orange is a quiet story, one that leaves you feeling uneasy the whole way through. One just ripe to become a classic film. Though instead of reading the novel, I listened to the story narrated by Rachel Bavidge, and spent many happy travelling hours lost in another time. I’m left though, with more questions than answers, and wanting to re-read the hardback version. Isn’t that how a good piece of fiction should leave you? Thank you to Penguin for the review. This entry was posted in Blog, Orphan Lit, Reviews and tagged country house, fiction, Judas hole, lies, memory, truth. Bookmark the permalink.